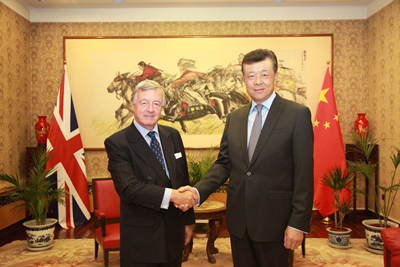 On 28 September, Ambassador Liu Xiaoming met with Jersey Minister for External Relations Sir Philip Martin Bailhache at the Embassy. They exchanged views on strengthening exchanges and cooperation between China and Jersey Island. Sir Philip Martin Bailhache said that the Jersey government attached great importance to developing relations with China, having established good cooperation with China in various fields. After the Brexit referendum, the current market access arrangements between Jersey and the EU in financial services and other sectors will remain unchanged. This will give Jersey a more prominent advantage. Jersey hopes to strengthen comprehensive exchanges and cooperation with China, and play a greater role in helping Chinese companies access the EU market. Ambassador Liu emphasized the "Golden Era" of the China-UK relations, in which both countries aim to take the global comprehensive strategic partnership to a higher level. In this context, Jersey Island could grasp the opportunities, use its strengths well and continue to actively expand its exchanges with China in economy and trade, education, culture, and tourism, in order to accelerate and update its cooperation with China.